Now in its 3rd year of operation, the CDA clinic in Siem Reap focuses on patient care, prevention, and awareness campaigns. In 2012 alone, its full-time mobile clinic screened more than 14,000 individuals. This was achieved with funding from Novo Nordisk for a one year period. Since 2012, CDA Siem Reap has been improving educational awareness in primary and secondary schools, as well as community groups. In 2013 we were very glad to be able to offer some free, additional services to our patients. Thanks to a generous donation, we were able to establish a regular foot clinic. Diabetic foot is one of the commonest complications of diabetes. If cuts are not treated quickly, they can lead to infection and eventually to amputation of toes, the whole foot or even a leg. Thanks to our exercise therapist volunteers from the University of Notre Dame, Perth, Australia, our patients received free consultations and customized exercise plans. We’re proud to have reached nearly 2000 students with programmes on non-communicable diseases (NCD), especially diabetes, and how it can be prevented through healthy eating and exercise. 13th June 2013 – We held the first inter-high school quiz at Sokha Hotel in Siem Reap between Angkor High School and Samdach Euv High School. Samdach Euv won the competition, 180 to 165. It was a close and exciting competition! 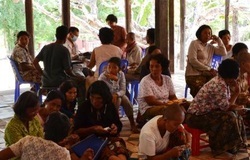 Also in June 2013, we began a new awareness programme geared toward all of Siem Reap province’s health centre volunteers and community members. This program is establishing peer groups and will appoint group leaders from among the training session participants. We look forward to working with these members of our community, who will help us expand the scope of the CDA.